Recently landing in the U.S. camping market, Australia’s popular Swag bivvy takes a different approach to traditional tent setups. We tested the Outback Swags sleep system on hot Tennessee days and chilly nights. Nestled in a canvas cocoon atop a cush foam mattress, I feel cozy and warm. The world around me is totally shut out — no wind, no lights, and no pointy rocks. That’s basically what you feel inside an Outback Swags Pioneer bivvy tent — complete isolation and security. Made of heavy-duty waterproof canvas, the Swag provides an all-in-one sleeper that’s about as easy to set up as it is to pronounce. Unroll the conical tent with footprint and mattress included, insert three half-circle poles and two stakes, and presto! You’re ready for bed. 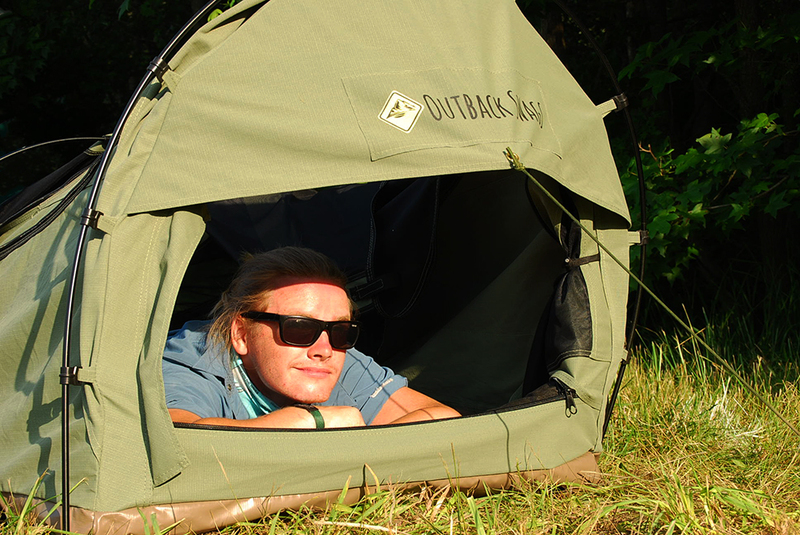 Read on for a full review of Outback Swags Pioneer tent. In short: Heavy-duty, waterproof, and intuitive to set up, the Swag is a great option for cooler climes, bad weather, and rough terrain. But it’s heavy, and less ideal as temperatures and humidity go up. 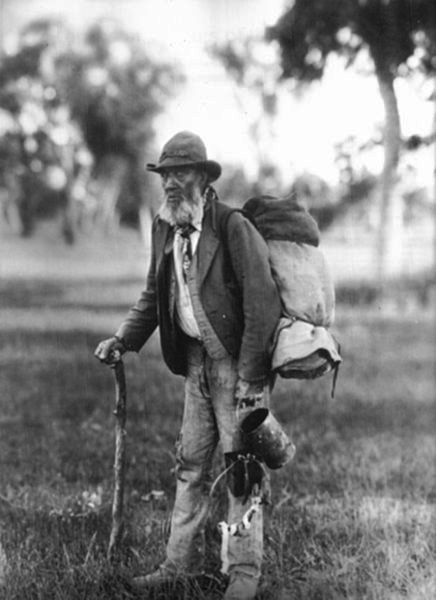 “Swags” originated in Australia in the late-19th century out of necessity. They belonged to transient farm laborers who tucked all their belongings into a canvas bedroll and hiked from job to job. Though the modern swag draws off the same principle of tucking the entire camp setup into one simple roll, the similarities end there. It’s still canvas, but the Outback Swags Pioneer uses poles to create a canopy, a PVC vinyl floor to block moisture and pokey sticks, and a removable top flap for ventilation. For more background on the swag, check out our preview of the Outback Swags American launch last year. For $229, you get a bivvy shelter made of 12-oz. ripstop canvas and a foam mattress. Altogether, the Swag system weighs 20 lbs. This is obviously NOT designed for hiking. The Outback Swags Pioneer is a burly camp setup. While it looks like a bivvy, it’s about as heavy as a five-person tent. 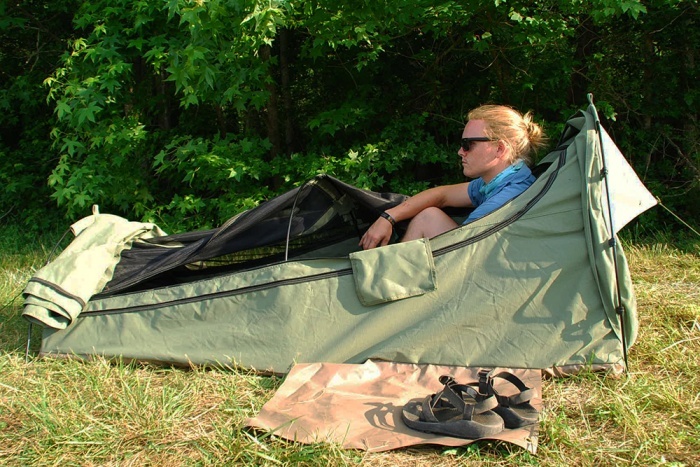 Those looking for ultralight bivvy setups – this is a different type of product entirely. They are apples and oranges. The Swag is really burly. The 12-oz. 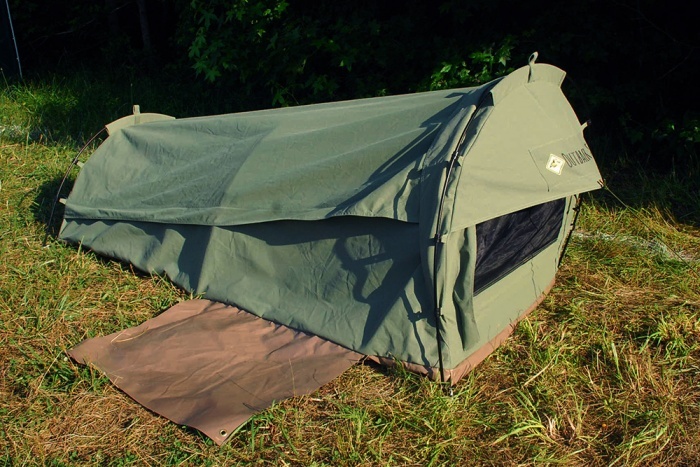 waterproof canvas shell is similar to material used in wall tents, and should take several years of abuse and foul weather without a compromise. The army-green shelter comes with three semi-circle poles of different diameters, eight stakes, and a matching canvas carrying sack. Packed down in its bag, the Pioneer tent measures just over three feet long, and about a foot wide. I have wide shoulders and had no problem slinging it across my back to carry from car to campsite. Unfurled and pitched, this swag extends 7 feet. At the head of the tent, it arcs to 31 inches high and 36 inches wide, and the entire structure tapers like a cone toward the feet. 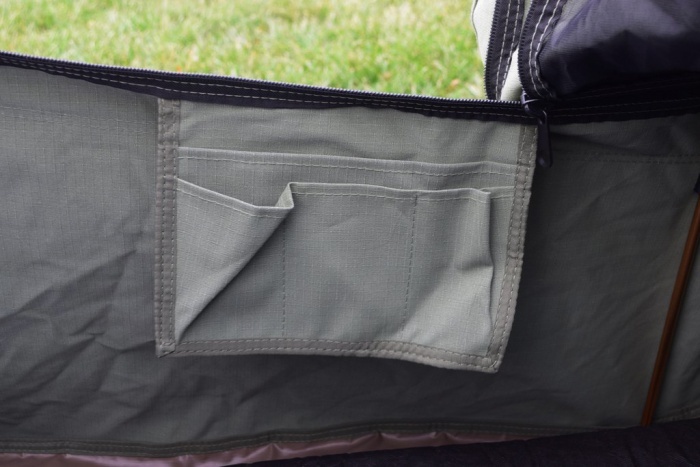 The top unzips and rolls back to reveal a mesh screen that runs the length of the tent. This helps with ventilation and keeps bugs out. It also acts as the main entrance to the Swag. There’s a zipper and bug screen on the front face of the tent, which increases airflow and serves as a second entrance. There are no vestibules for gear, but inside is a four-pocket storage sack, suitable for small toiletries, a headlamp, phone, and wallet. 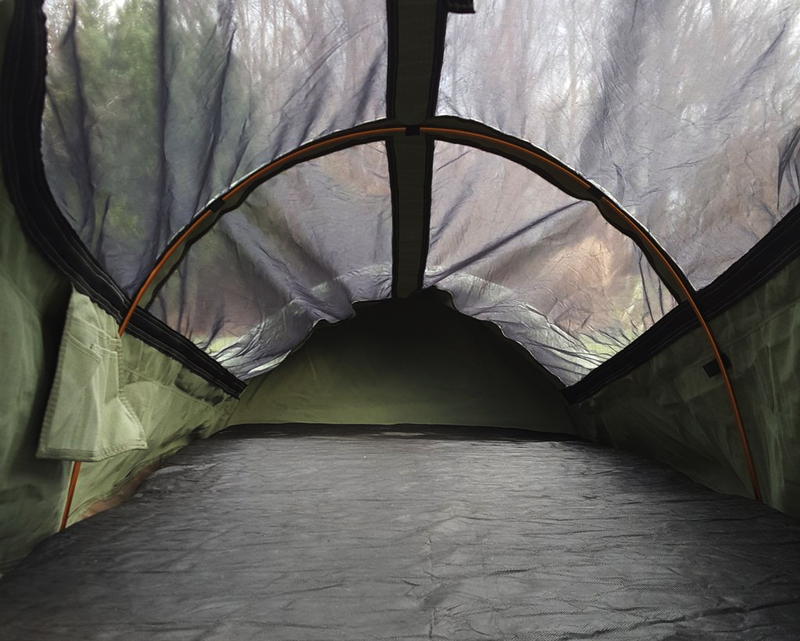 Outside, a vinyl shoe mat extends to one side of the tent. I set up the Swag for a six-night camping trip in Manchester, Tenn. While I was prepared for the heat and sun, I did not expect the cold and damp that come with southeastern nights in the summer. That’s really where this tent shined. Every night, temps dipped from near 90 down to the high 50s, and condensation was everywhere. The Swag was damp and covered with moisture. However, the inside of the shell was totally dry — and warm. Everything about sleeping in the Swag feels more insulated than in a tent. I had a thicker layer around me that blocks wind, water, and light. I felt more protected from the elements than in a traditional tent. During the day, even in the shade, the Swag was too thick and heavy for the heat. Even with the top rain cover rolled back and the front flap open, the Swag’s thick canvas walls trapped a lot of heat. But at night, it was perfect for staying warm. And when it wasn’t sweltering, the foam mattress was plenty comfortable. It’s not as cushy as a big air mattress, but it’s a great and comfortable addition to a simple bivvy shelter. Setup was simple and took about three minutes. A front pocket underneath the mattress holds three poles and the stake bag. The largest pole runs along the head, the smallest at the foot. The middle pole runs inside the tent, which was slightly inconvenient getting into and out of the tent. But once I was used to it, I stopped noticing it altogether. Then, stake the front and rear guy lines, and the Swag is up. At $229, the Outback Swags Pioneer is competitively priced to traditional tents. It is not meant for hike-in camping or any trip where space and weight is a consideration. But for cool- and cold-weather camping it shines. And its heavy-duty construction, thick walls, and waterproof canvas make it ideal for stormy conditions. If you have a car to get you there and store the rest of your stuff, this is a simple, cozy sleep setup.